Rabbi Michael Broyde, a high-profile Jewish and legal scholar based at Emory Unversity, has apologized for deception. 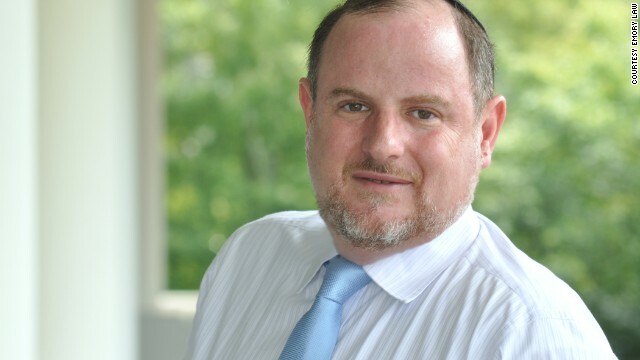 Atlanta (CNN) - A top-tier rabbi and expert in Jewish law and ethics is now under the microscope for what many see as his own ethical transgressions. Rabbi Michael Broyde was outed last week for having created a fake identity that he reportedly used for about two decades. Broyde has long served on America’s highest Modern Orthodox rabbinical court and was said to be a finalist to become the next chief rabbi of the United Kingdom. Just last month, he was named one of America's top 50 rabbis by Newsweek magazine. Broyde is a professor of law and religion at Atlanta’s Emory University. Under the pseudonym Rabbi Hershel Goldwasser, Broyde cited and promoted his own work, wrote and weighed in on articles, gained membership to a rival, left-leaning rabbinic organization and engaged in otherwise privileged online conversations by way of its Listserv. The story came to light Friday when The Jewish Channel, a cable network, released online an in-depth investigation. The lengthy piece revealed, among other things, how a search to find Goldwasser, who allegedly lived in Israel, led to IP addresses matching Broyde’s. Broyde initially denied involvement when contacted by The Jewish Channel last week - a move he’d later call “silly and a mistake.” But he fessed up soon after the story’s publication. In a blog post titled “My Nom De Plume Exposed,” he explained that he and a friend created and used the pen name up until a few years ago, after which he said it was used by others. In his blog post, a written apology spoke for both of them. “No malice was ever intended and our participation was always intended to foster vigorous conversation about ideas and approaches to halacha (Jewish law) that we thought needed to be addressed,” he wrote. But he also added that there’s an “old practice” of using pseudonyms when discussing these sorts of matters. "There were many fine reasons for creating this pseudonym, and this one was suggested to us many years ago. Basically we were told that given the level of unpleasant discourse in our Orthodox Jewish community, some things just need to be said pseudonymously. "But, yet, it does strike me as somewhat inappropriate for me, and I particularly regret joining any professional organization pseudonymously. "I publicly express here my apologies to those who were deceived by my pseudonymous writing." By Sunday night, it was clear that, at least in his corner of the Jewish world, Broyde’s standing was shaken. The Beth Din of America, the top rabbinical court affiliated with the Rabbinical Council of America, issued a statement that Broyde had “requested an indefinite leave of absence from his role” as a member and judge, a request the court accepted. Meantime, the International Rabbinic Fellowship, the more liberal group Broyde once joined as Goldwasser, also weighed in, dubbing his actions “shocking and saddening.” The fellowship suggested in an online statement that given Broyde’s infiltration into “a sacred and safe space in which our members can share ideas and thoughts,” he should issue apologies directly to those with whom he’d corresponded. CNN reached out to Broyde on Monday, but he said he could make no comment. The question remains as to whether any of these developments will affect Broyde in the secular academic world. But unofficially, Paul Root Wolpe, director of the Center for Ethics at Emory University, said he suspects Broyde will feel less of a blow on campus. Joining a rabbinical organization's Listserv under a false name is wrong, but it may not be "an academically sanctionable offense," he said. Yes, he submitted work to a journal under a pseudonym - which on its own isn’t unheard of, but he did so without disclosing that fact to an editor. And, yes, in a world where citing someone else’s work is a form of “academic currency,” he cited his own, Wolpe said. But he didn’t plagiarize, nor did he steal someone else’s research. Those sorts of actions are tenure-breaking. HeroesAre Rare .........you now the drill are pages going to disappear here too ! You to the peachy one...................No red horn-y devil ! Earth’s timeline ................chad remember this long ago..........L4H but me on the list for this. Trace our planet's geological and biological ages............better than the bibles timeline. By the way HAR/chadie..........your header on post was ............see below........so do not go deleting comments ! Hey faith.....the peach.....chadie too...... did you learn or hear from that Discovery show about the LAND BRIDGE ? How many years ago did we cross into North America ?.................chad , faith topher too ? Mind your own damn business. You weren't there, you don't know the people involved so shut up. Every time the Catholic Church is mentioned you all slither out of your ponds to kick up about something you know nothing about. Don't like it --– back off and get on with your lives. This guy played his own religion like others play the game in an episode of Survivor or Big Brother. Lying in the name of religious ambition – as old as religion itself. all he wanted was a good stock tip. A lying religious leader? Gee, what a surprise.